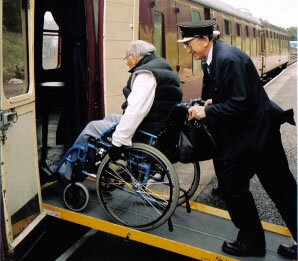 The Strathspey Railway provides one third discount off the standard 2nd Class standard travel ticket for the Less Able passenger and, if applicable, one Carer may travel free of charge on providing appropriate documentation. If you are booking your tickets online, please call our Office on 01479 810725 so as we can assist you with booking and payment. The one third discount arrangements for a Less Able visitor, with their Carer applies to First Class travel but the standard £25 charge will be payable for a First Class upgrade. 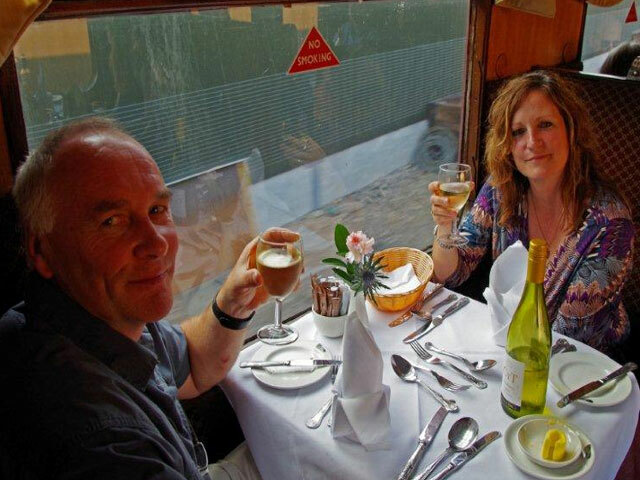 The one third off discount for a Less Able passenger and their Carer does not apply to Dining, Special Events and Packages Tours and Experiences. If a Less Able visitor is confined to travel in our Guard’s van, they and their Carer may both travel free of charge If they have booked catering options the return travel will be deducted from the full price. To download our full Accessibility Statement with information about alternative ways of accessing our Aviemore Station, our Attraction, Parking, Catering facilities, Toilet facilities and other information, please use this LINK. For detailed information about our facilities, please refer to our Access statement. The Access Statement refers to our daily service trains, and provides detailed information for visitors departing our Aviemore station. For Accessibility related information regarding our Dining or Diesel multiple units trains, or if you have any specific questions regarding Accessibility at our Boat of Garten or Broomhill stations, please phone our Office on 01472 810 725. The Strathspey Railway Platform 3 can be accessed by foot on crossing the footbridge located at the mainline station in Aviemore. Getting there by car: From Grampian Road which is where Aviemore main street is located, go to the very south of the village passing the train station and the petrol station on the left, and passing Happy Haggis on the right. You will reach La Taverna restaurant where a roundabout is located. Take the left exit signposted Cairngorm Mountain and then take the next immediate left which will take you to Dalfaber road running parallel to the river Spey. You will first pass a holiday house estate, then Aviemore Bunkhouse and The Old Bridge Inn on your left before the road forks into two, steeply going up towards The Strathspey Railway car park and train station. Parking: Grit car park. Two clearly signed Accessible Car Park spaces available in our car park. Access: For access to The Strathspey Railway Platform 3 from the car park, a level crossing via a long gradual ramp is provided. Level entrance to ticket office: Level entrance to Ticket Office Available. Wheelchair accessible toilet. Yes – a wheelchair accessible toilet is available on platform. Please telephone in advance and notify station staff on your arrival for our daily services. 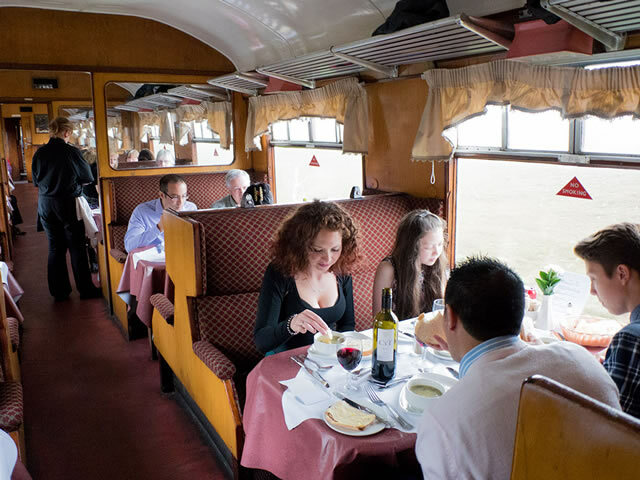 Our vintage carriages, with both Country Class and First Class seating areas, having been built in the mid-1900s, are regrettably not accessible for wheelchair users. If less able visitors can take a few steps to our First Class and Country Class seating areas, station staff and guards will be readily available to offer assistance to anyone that requires it. Wheelchair accommodation on board is limited to our Guard’s Van. This is in a smaller area of the main carriage set where wheelchair users can remain in wheelchairs throughout the trip along our line (Space is limited to a maximum of two wheelchair users), with a very limited number of seats available for family, friends and carers. Station staff and guard staff will be available to assist any visitors who may be restricted to travelling in the Guard’s Van. Unfortunately, we have no disabled access to toilets on board our heritage carriages. We regret that our Fine Dining carriages are not currently wheelchair accessible. Please note these facilities will be being upgraded for future visitors. 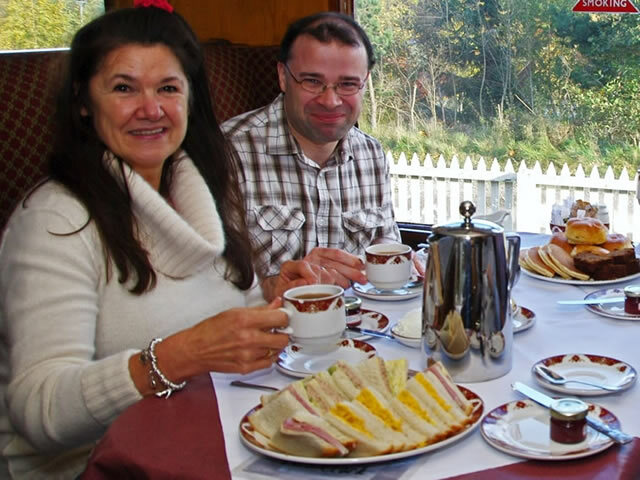 Coffees, teas and bar facilities available on board and served at your table. From Boat of Garten LOCATION: At railway station in centre of village PARKING: On tarmac beside Boat Hotel , adjacent to platform. Accessible parking available. ACCESS: Level entry access. Regrettably, no wheelchair accessible toilets. From Broomhill At station off minor road to Nethybridge from A95. PARKING: On Roadway at station ACCESS: Level to platform at side of building. TOILETS: Ladies and Gents toilets available. Accessible toilet available.